Take a look in detail at what makes our greenhouses the most advanced in the World. Observe the clean lines, free from fixings. 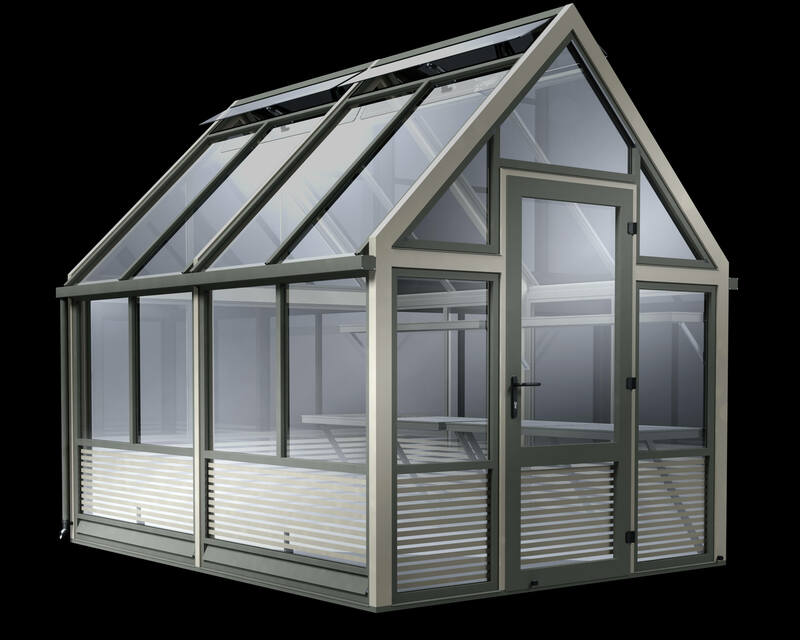 See the superior ventilation in action and how we combine modern materials to produce a unique and attractive greenhouse. 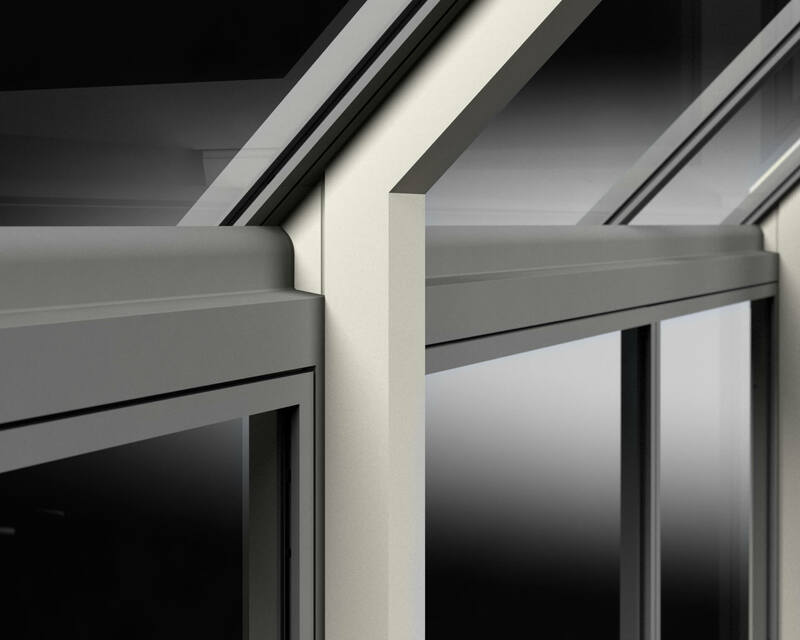 High capacity, strong aluminium gutters will carry the rain from your greenhouse roof to provide the water that will ensure your plants will thrive. 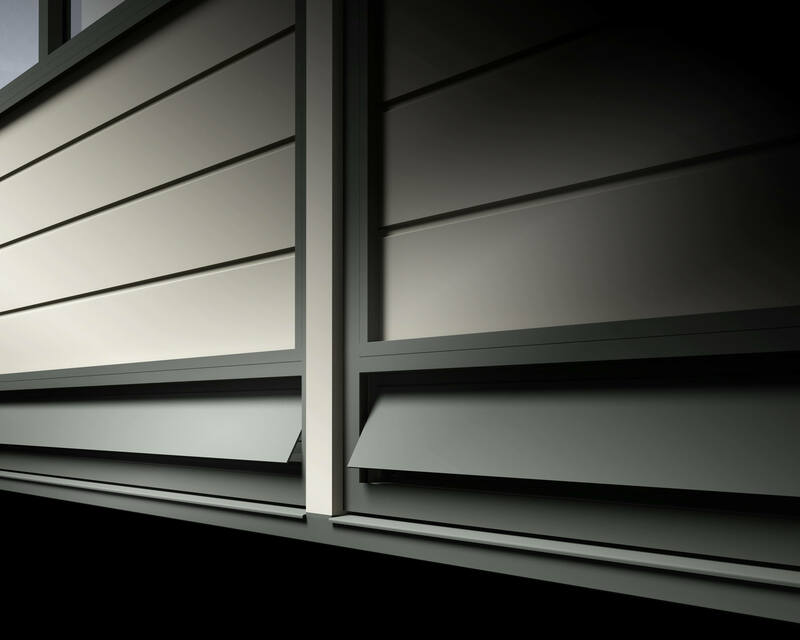 Our securely fixed gutter and downpipes which can be adjusted to length will allow you to collect this precious commodity in your waterbutt. Whether you choose to collect or discharge the water Cultivar provide the means. Wide 750mm toughened safety glass panels set into slim aluminium frames give plants the warmth, light and ultraviolet light required for promising propagation. 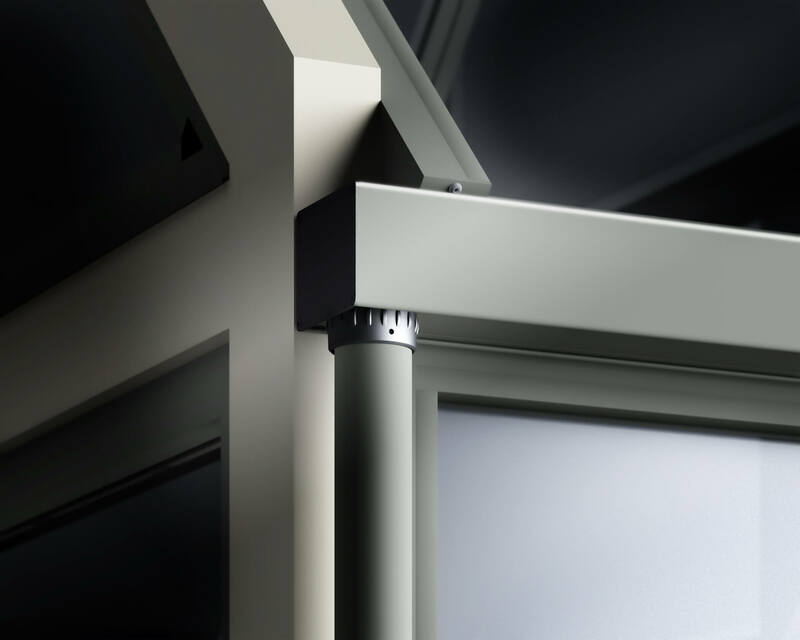 The frames are designed based on modern sophisticated window frame principles but miniaturized to allow more light. 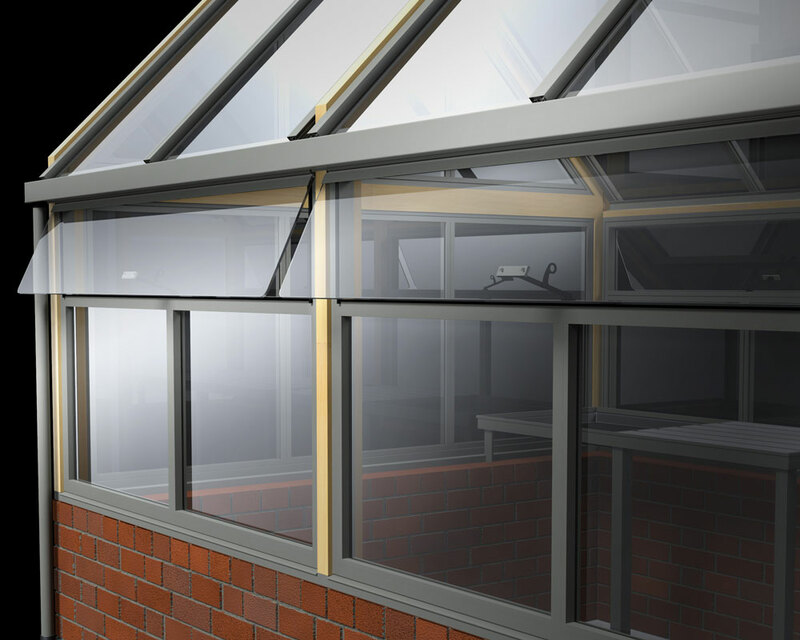 The glass rests between EPDM gaskets which allow the glass to expand when it gets hot but makes sure the glass is securely and snugly held in place with no rattles. 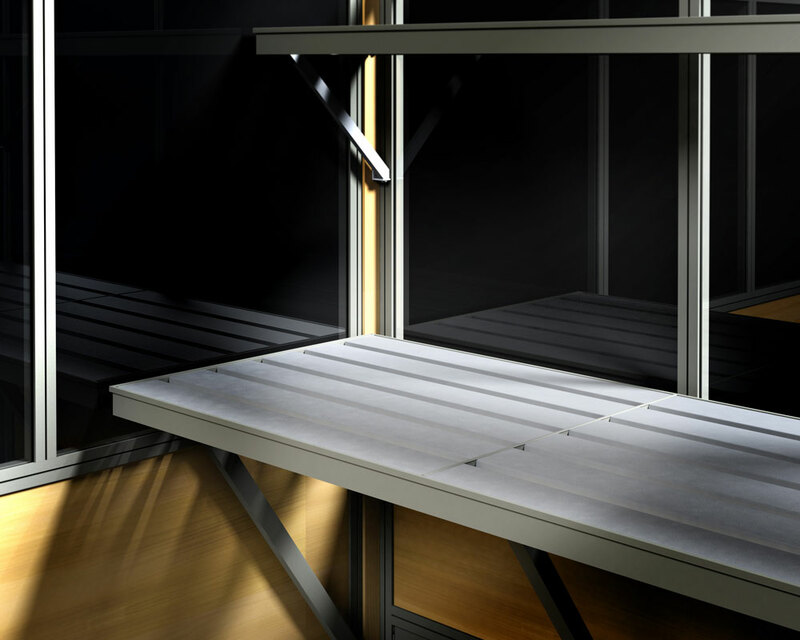 The framework is powder coated in quartz grey, RAL7039, for a maintenance free finish. 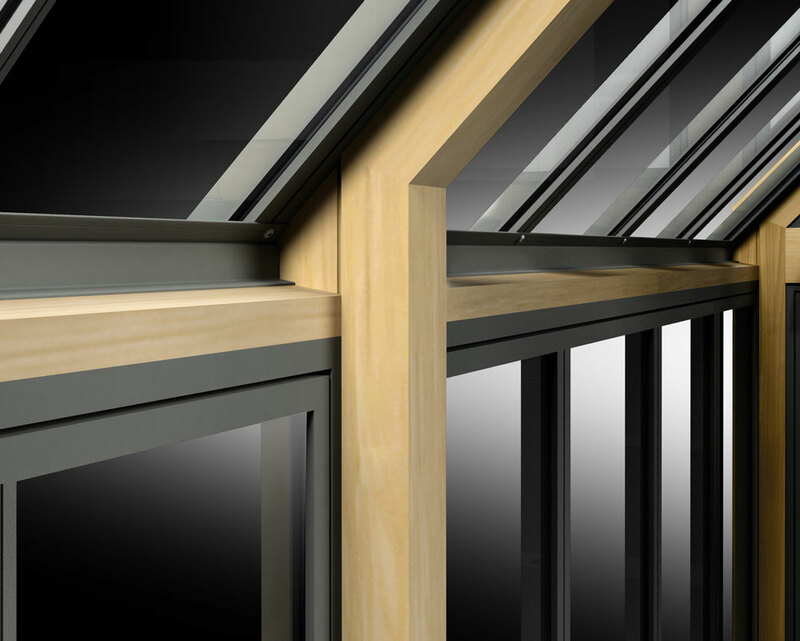 Accoya is not only attractive, maturing to a grey patina, but is long lasting and dimensionally stable. The perfect tongue and groove boarding is machined to our exclusive design as we need consistency of quality and boards that will not warp, twist or bow. Twinned with full length low level ventilation the Plant House is both good looking and talented. 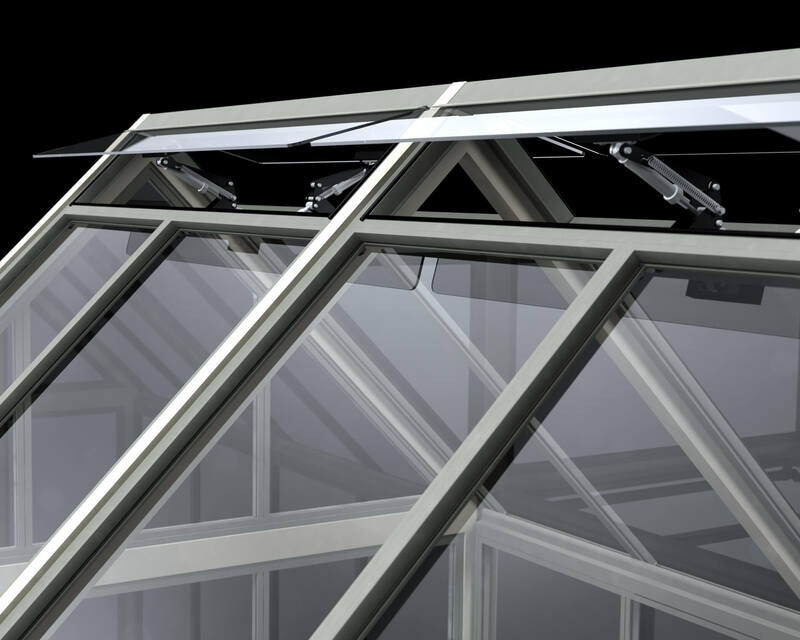 Automated vents located at the plinth level run the entire length of each side of the greenhouse, providing more than enough ventilation. These automated flaps will provide the very best growing conditions. The autovents react to increased air temperature to ensure that your plants are not exposed to extreme temperatures. In the instance that you are building a dwarf wall on which to sit your greenhouse we offer full length eaves ventilation. These run the entire length of both sides of the greenhouse and are operated manually with a simple central opener. 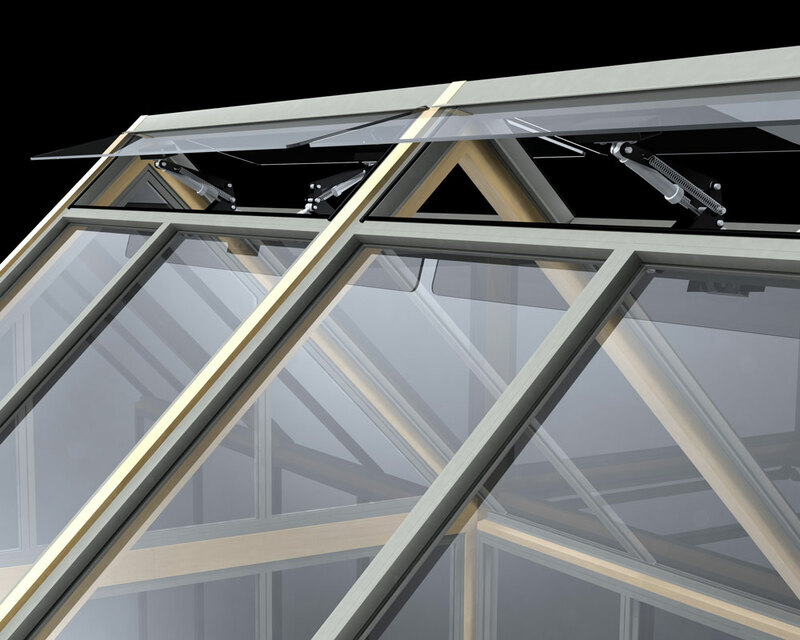 Like the roof ventilation these are frameless and made from 6mm toughened safety glass. 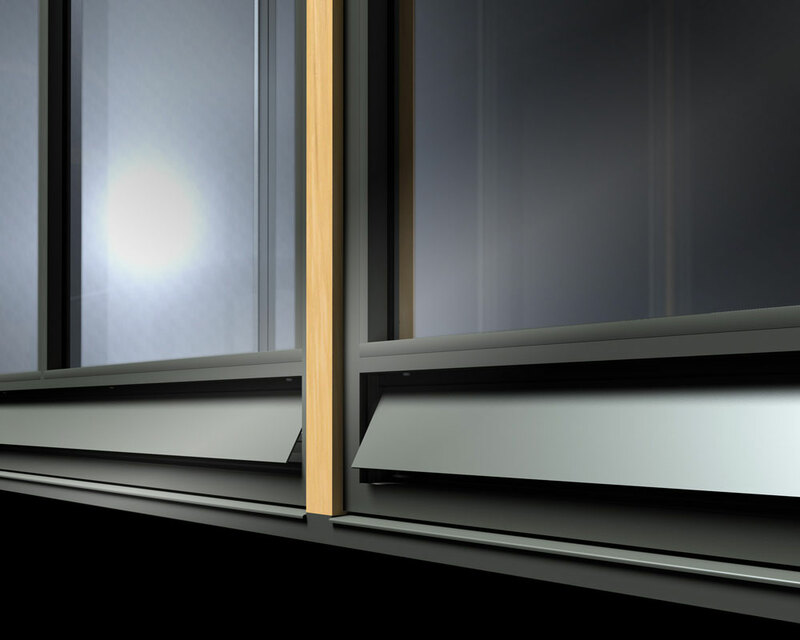 The edges of the vents are polished and the corners are designed with a radius for safety. Automatic openers can be exchanged for manual openers should you desire. Work benches have never been so thoughtfully designed and have probably never been so strong and versatile. 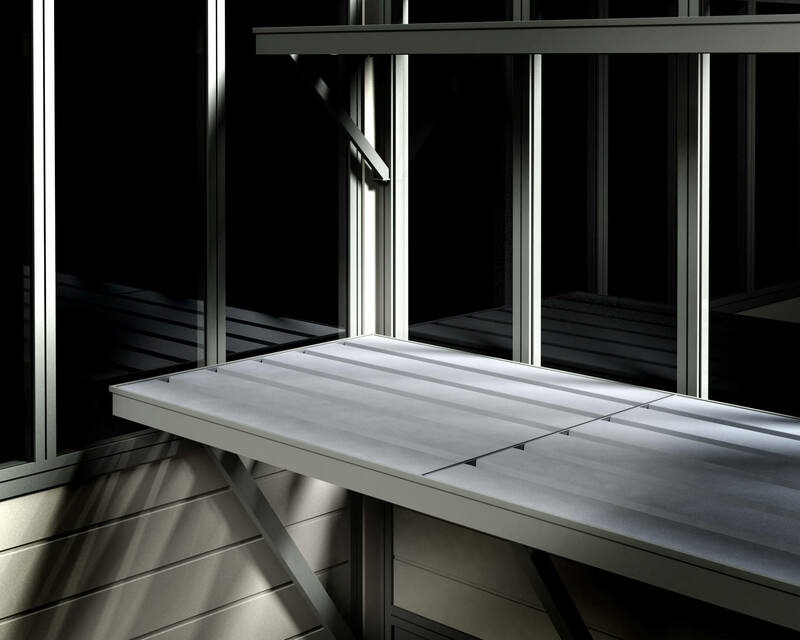 When installed the slatted aluminium surface will support all your plants. You can choose to have the staging down one or both sides depending upon your growing plans. If you would like a softer surface then our aluminium slats can be replaced by Accoya, an aesthetically pleasing, strong and reliable alternative. If you would like a sand bed or pea gravel then that’s no problem, just call us to discuss your needs. You can also buy online a ABS Plastic Tray for the 8 and 10 foot wide models which can be used for potting up or to soak your pots. There is also a hidden advantage, your staging can be folded down, just remove the tray and it will pivot down in a flash with the external frame. If you prefer you can unhook the staging for complete removal. This will create a space should you wish to grow tomatoes during the summer months. The shelves adopts a similar range of options and facility. 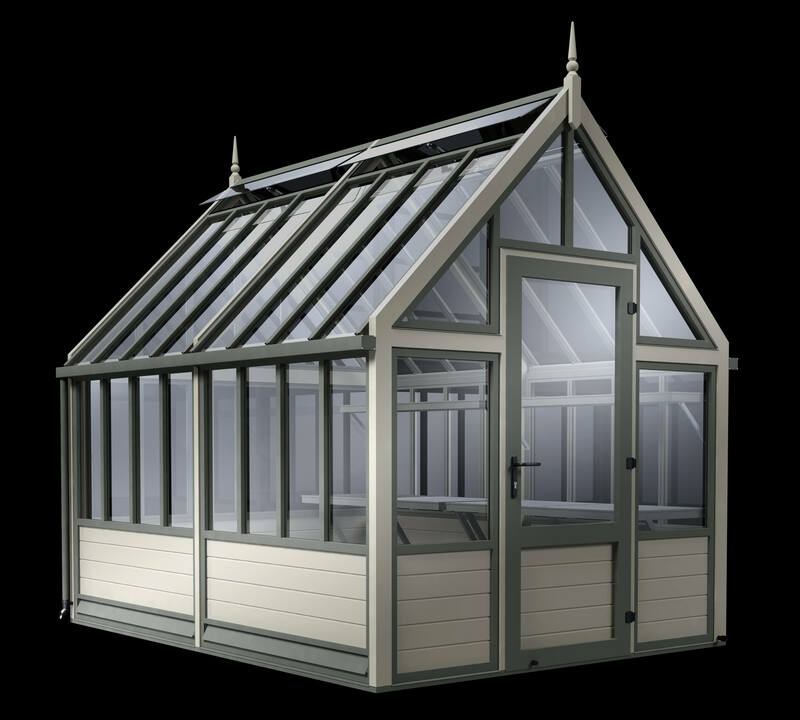 The practical and attractive framework is finished in quartz grey, RAL7039, to co-ordinate with the greenhouse. 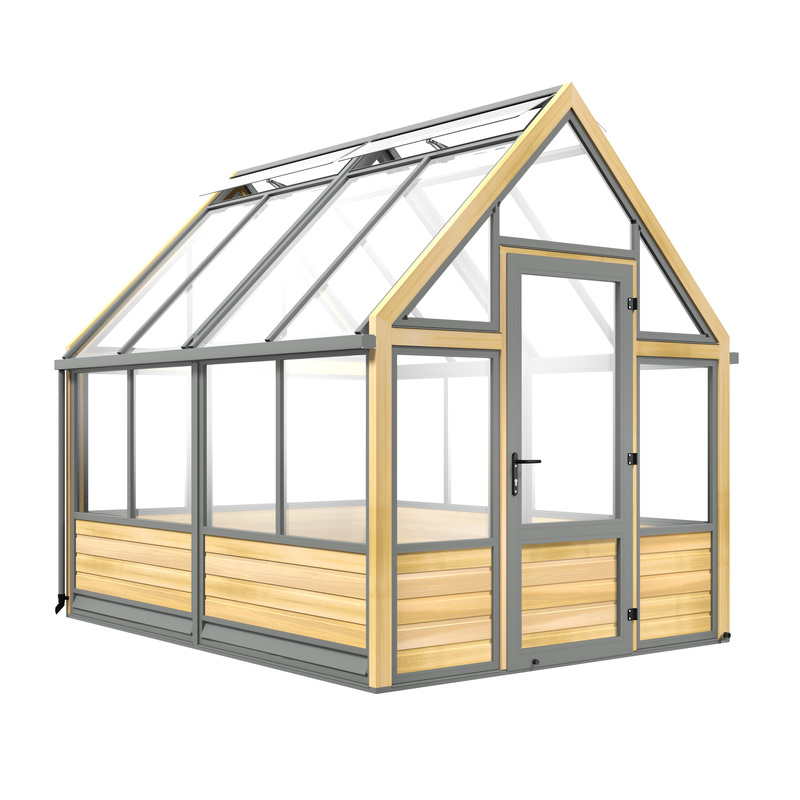 Accoya is obtained from fast growing sustainable sources including FSC, it is treated with natural occurring acetic acid which modifies the core producing a hard, dimensionally stable, beautiful solid wood, exceeding the qualities of tropical hardwoods. 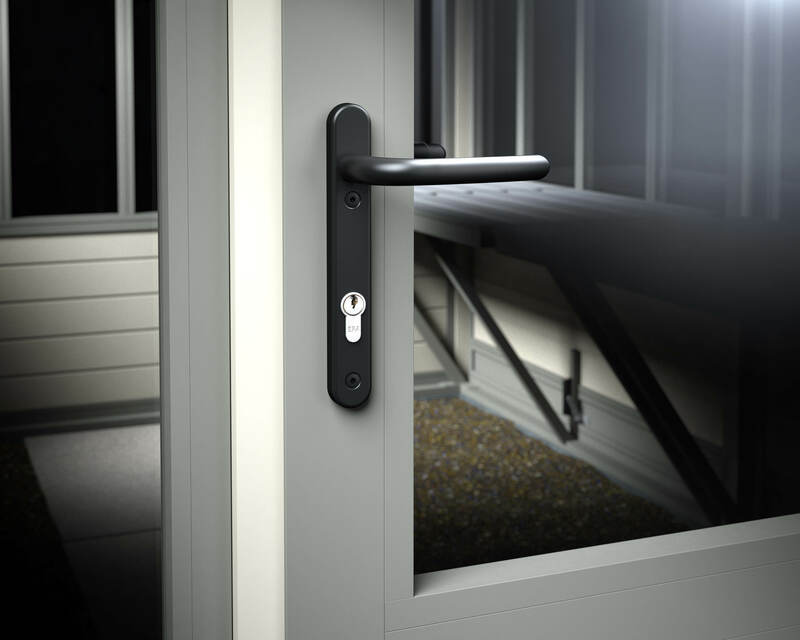 Its consistency and durability (up to 50 years) is perfect for outdoor use. Air circulation starts low down in our greenhouse but hot exhausted air can escape through the handsome full length ridge vents, located on both sides of the greenhouse for optimum air flow. Plants love air movement, you will be rewarded if you offer plenty of fresh air. To this end our vents are automated with heat sensitive cylinders and strong spring mechanisms. 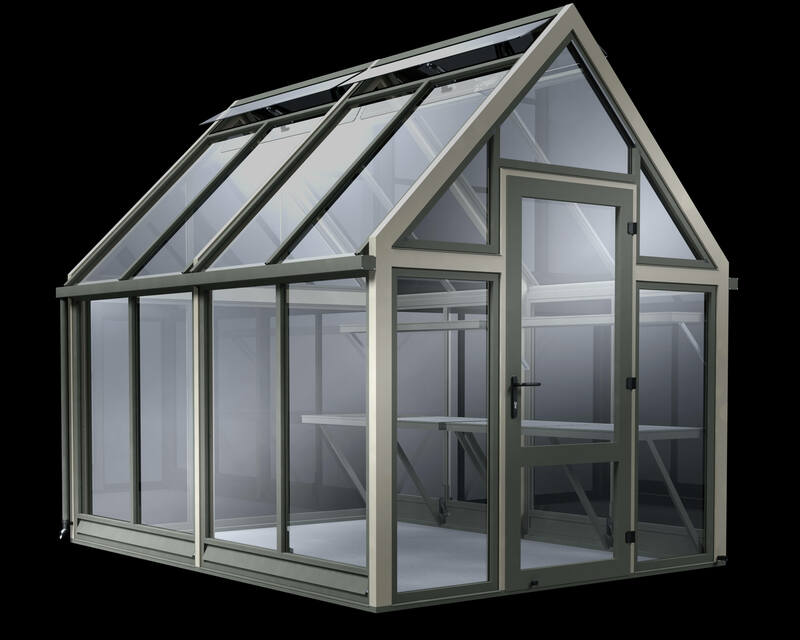 6mm toughened clear glass panels allow maximum light and the openers allow maximum ventilation. Door jammed or loose on it’s runners ? Not with a Cultivar Door. This class beating door wide enough for a wheelbarrow and on the 8 and 10ft models good for wheelchair access with a low threshold. 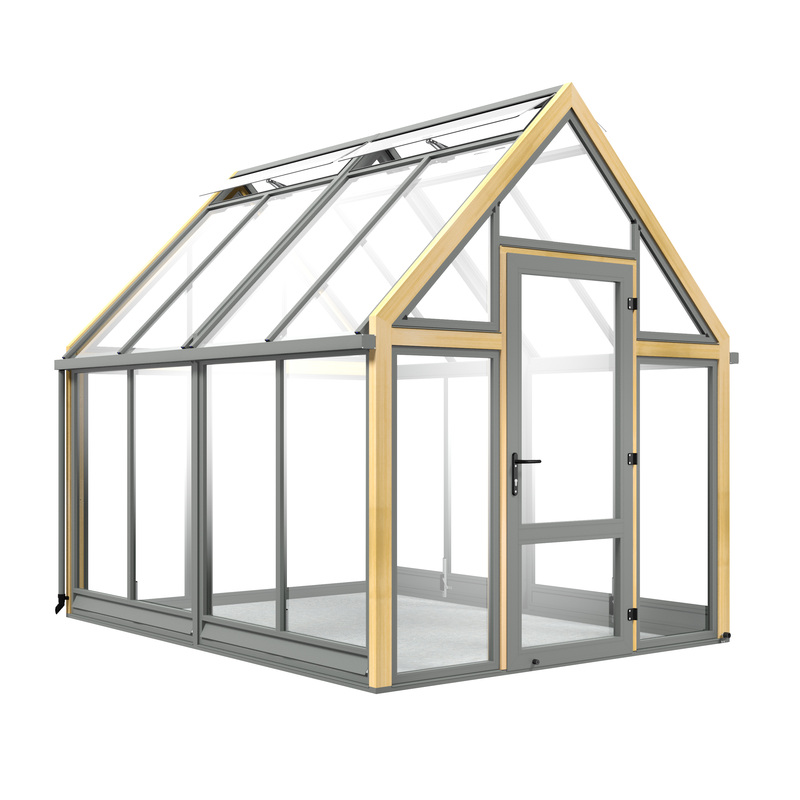 It’s solid aluminium frame elegantly sits within a wooden Accoya framework. 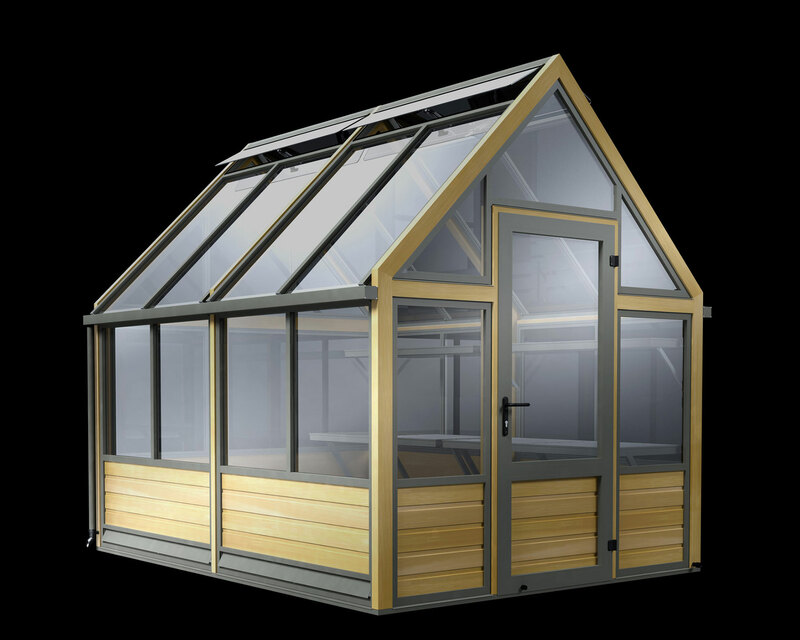 Glazed uppermost with toughened safety glass whilst the lower section has heavy duty Accoya wood paneling, it’s designed for a lifetime of hard work. 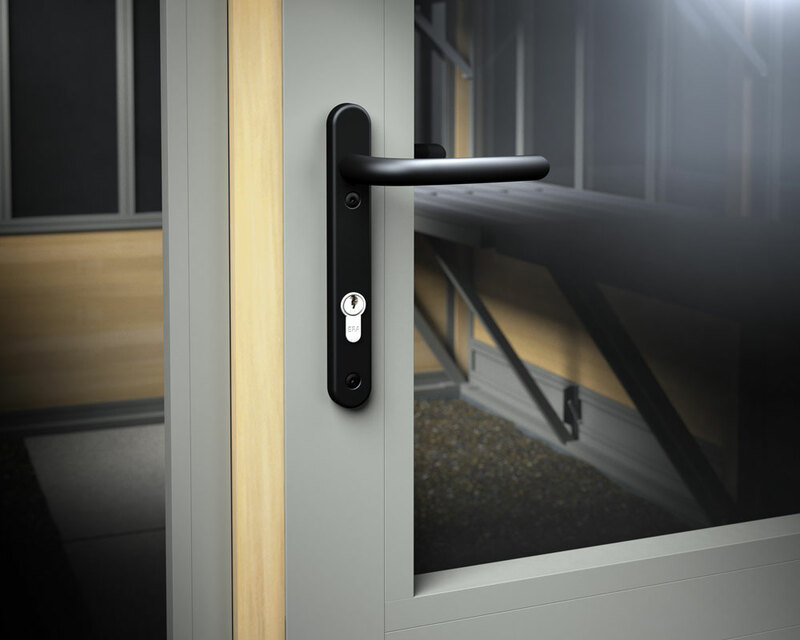 Not your typical greenhouse door, this one is secure, a high specification Eurolock (with spare keys), a quality handle, inside and out, hinges that will comfortably carry the weight of the door opening to 180 degrees where a push action will keep the door secured back and a pull will release when the day is done. Forget delicate 2mm horticultural glass, broken storm damaged panes. Other than boulders there is not much that will break our 4mm toughened safety glass. 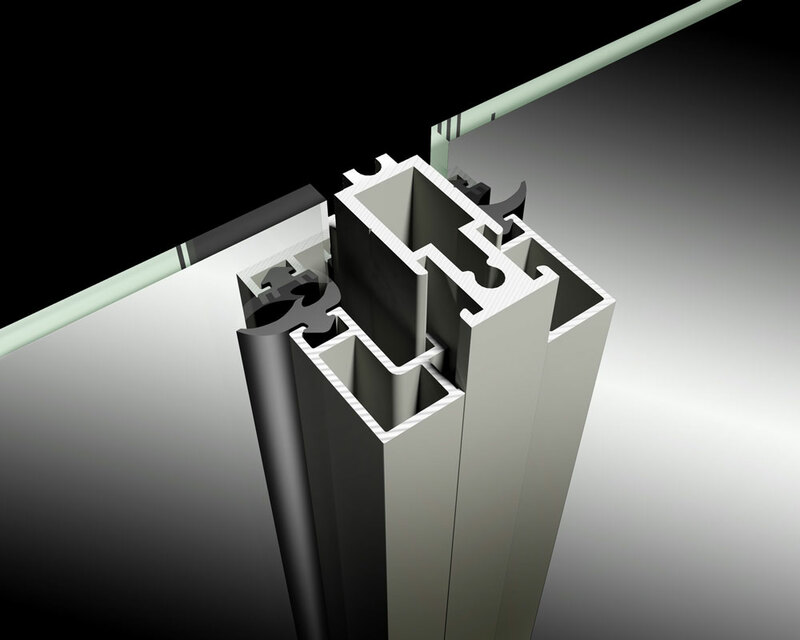 Captured securely our strong frames and rigid construction will further protect the glass. Like all safety glass it will not shatter into shards but into small crystals which can be swept up. In any case it’s a one in a million chance but easily remedied by a simple replacement method. Designed to last a lifetime 4mm or 6mm toughened safety glass to British Standards is used throughout a Cultivar Greenhouse. 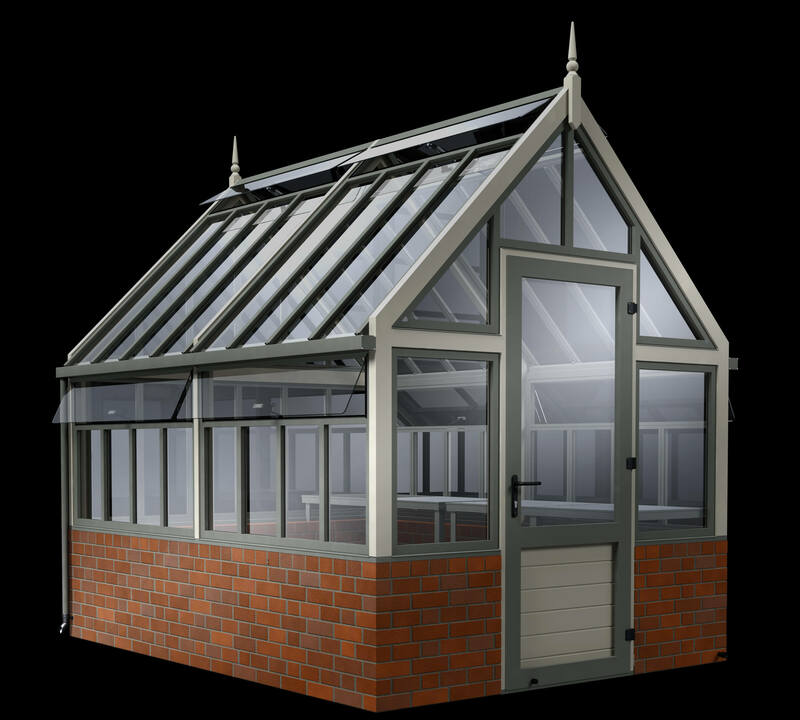 The traditional dwarf wall greenhouse can be given a new look for the new century. Glazed bricks in a wide choice of colours would create quite a stir if you chose to contrast your new pastime and hobby centre to the appearance of your home. Brick bases can be a sensible but long term choice for the enthusiastic gardener, a sign of serious intent. 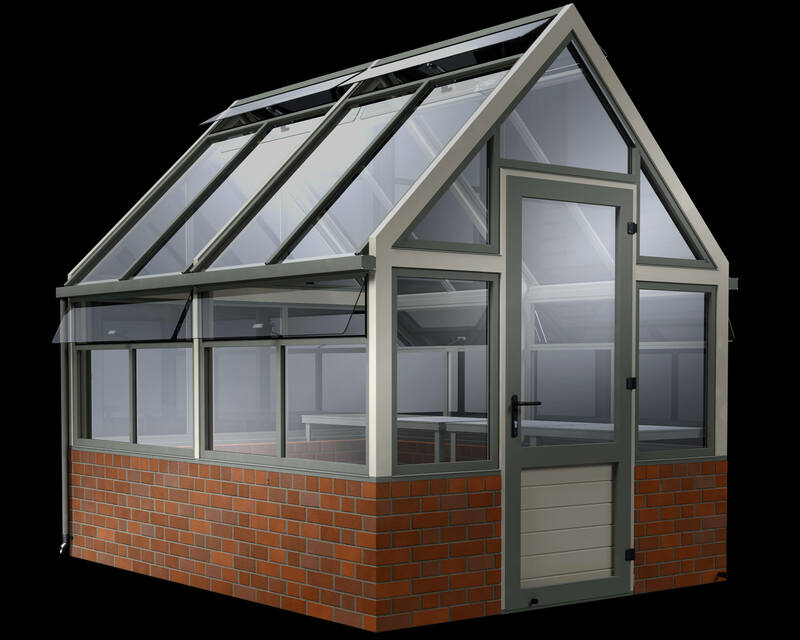 Furthermore brick wall greenhouses give a more even temperature throughout the structure, they’re slower to heat up and slower to cool. 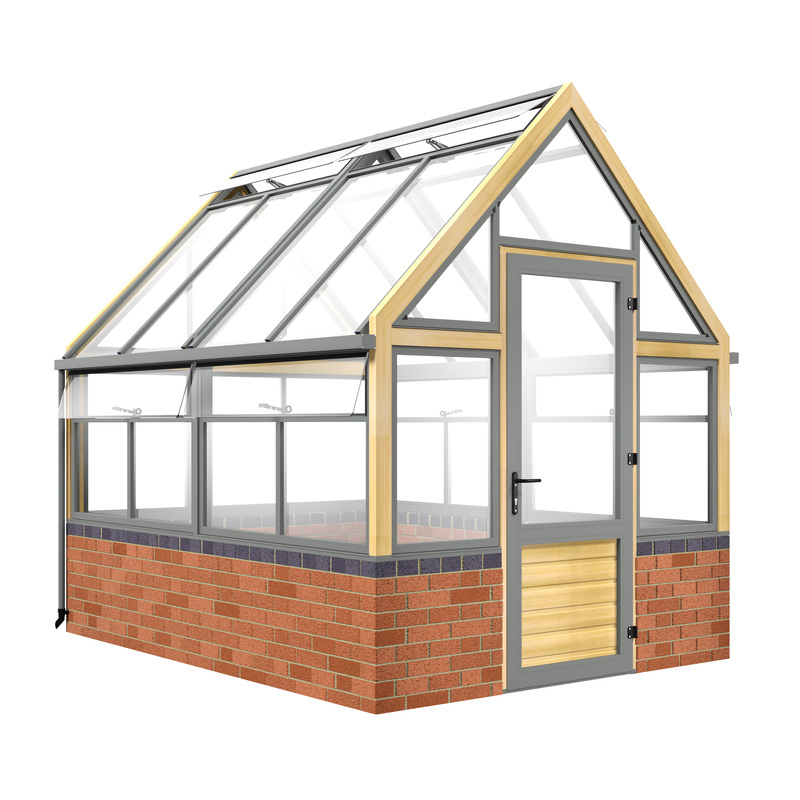 If you are seeking this option then discuss with your builder the plans for your new greenhouse base. This dwarf wall greenhouse page might give you some inspiration as to the sort of bricks available. 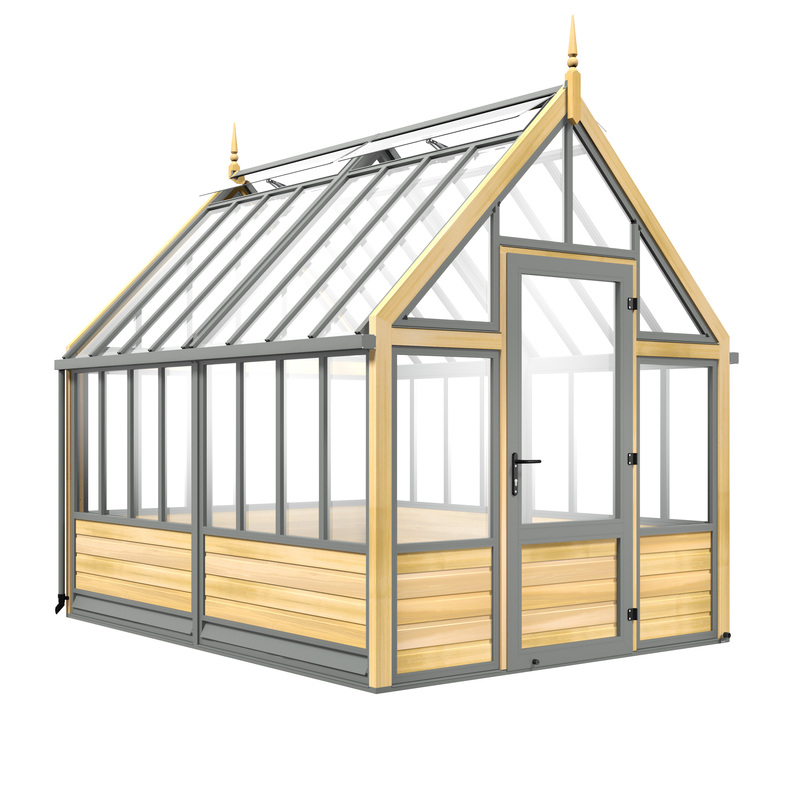 We have married our extensive experience in the greenhouse industry with a desire to design a beautiful glasshouse using a combination of engineered timber and aluminium. This 'spotlight' shows in detail some of the modern engineering and design features and highlights. 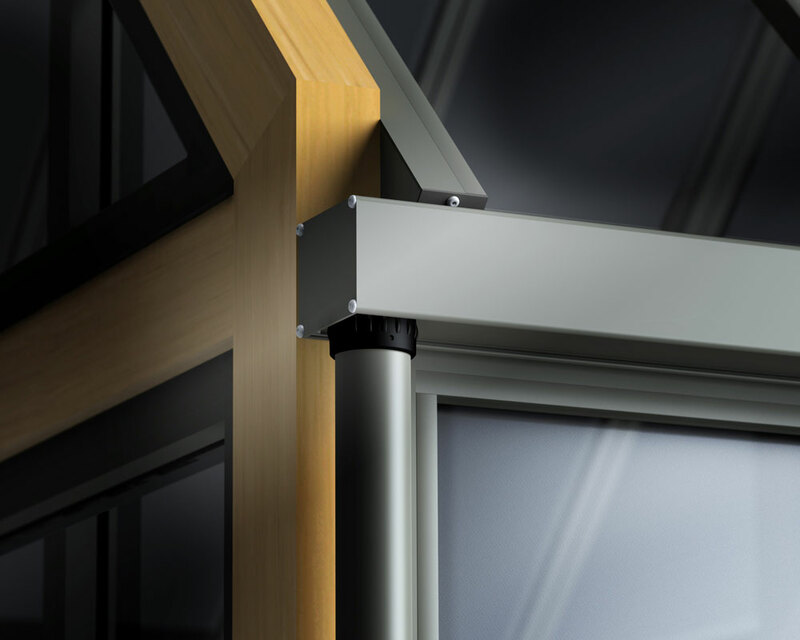 Scan the areas and see how well the wood and aluminium combine, see the unique ventilation systems, the secure stylish door or just the sophisticated glazing system. Combine all these with the finest quality, unsurpassed service and surprisingly competitive pricing for the perfect package. Call us on 01978 810 103, we are here to help.